Wonderful update for you today! The good news now is that all my Four Seasons prints & canvases (and a couple of the originals) are now available for sale to the public!! 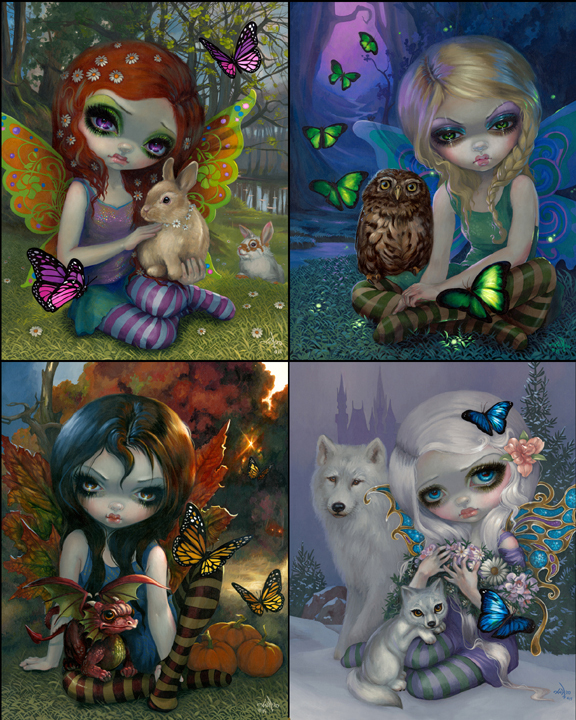 We have the prints for all four seasons, various sizes, and sets of all four together on SALE this week (from only $9.99 each) at Strangeling.com HERE. Limited Edition Canvases and any remaining original paintings are available directly from Pop Gallery - email them here or call 407-827-8200. In Patreon news - congratulations to Elisabeth of Phoenix, AZ for winning my set of autographed Three Fates figurines! And another congratulations to Vicki of New Tazewell for winning this month's FREE original painting Tiny Treasure! I'll be announcing the next giveaway shortly, and we'll be doing yet another original painting giveaway in January. The giveaways are through my Patreon here - As long as you are signed up (subscriptions start at literally $1) you will automatically be entered in all of them. And finally just a head's up - the "Bone Chariot" Limited Editions are SOLD OUT. The final (#5 of 5) one is up for auction HERE on eBay, a Masterpiece Edition, 36" in size, hand embellished by me, with bidding starting at just one penny. This will be your last chance ever to buy one, no more will be made. New THROW BLANKETS - these are so pretty, and just in time for the beginning of winter! 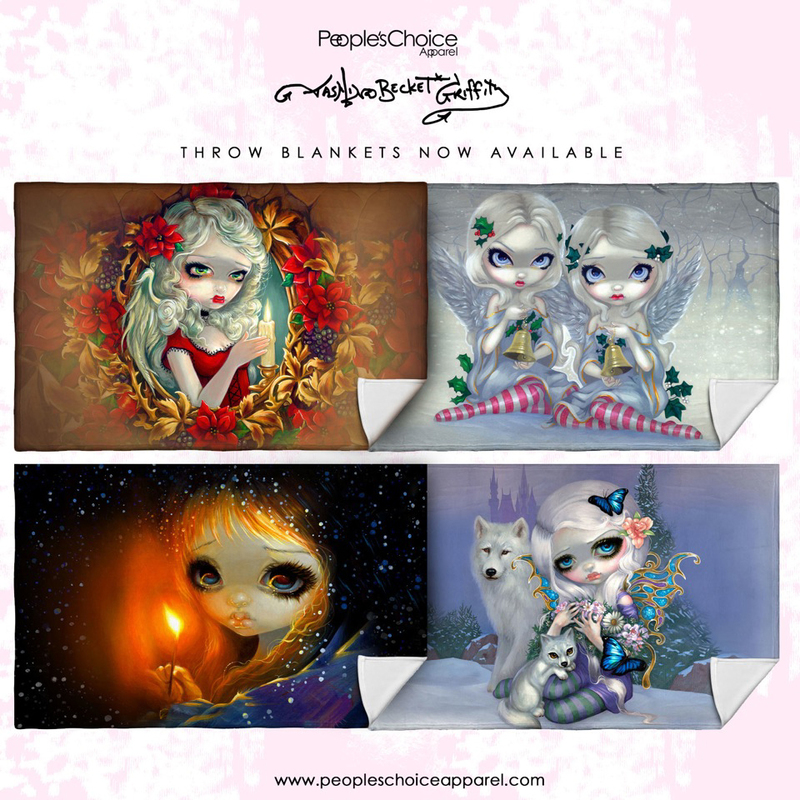 "The Little Match Girl," "The Holly & the Ivy," "Winter," and "Christmas Candle" are all available worldwide as super soft throw blankets here (be sure to scroll down at the end to see my blankets for sale). And finally, I've got a new work-in-progress to show you - wonderful creepy painting called "Smile" - be sure to scroll down to see her! Yes, my Four Seasons are finally available! You can order them individually or as the full set of four. Each one originally was a 16x20" Original Acrylic Painting $6400 - framed they are in gorgeous ornate 25x29" frames - I know for certain "Winter" has already been sold, and all of the MINI paintings have sold, but the others may still be available at Pop Gallery - - email them here or call 407-827-8200. They will happily ship WORLDWIDE. We have all the glossy paper prints signed by me on the back up at Strangeling.com here ($9.99 for 8x10s and $19.99 for 12x16s). Beautiful full sized 16x20" hand embellished limited edition canvases are EXCLUSIVE to the Pop Gallery - you can email them here or call them at 407-827-8200 to place an order, they are happy to ship worldwide, the canvases are masterpiece style and priced at $595 each. Just in time for the start of Winter! Click HERE and click "Blankets" or click HERE and scroll to the bottom! Get ready to be snuggly! I've got new throw blankets up at People's Choice Apparel! Click here - and then click the "BLANKETS" tab (it will make you land on the shirt page first). If this link does not work in your browser, click here instead, and then scroll all the way down at the bottom to see mine. These are SUPER soft blankets, measure 57” W x 36” H, $59 each and YES they ship worldwide! As per usual, I'm just the lady who does the paintings - if you have questions about the blankets, ordering, shipping, costs, etc. be sure to contact the blanket company at the website above. So cute!! Last Chance - "Bone Chariot"
Yes, my beautiful Bone Chariot Limited Editions are now all sold out. A Masterpiece Edition that is a whopping 36" high, hand embellished by myself in acrylic paints, and numbered #5 of only 5 ever made, the very last one is up for auction on eBay right HERE. To give everybody one last chance at this beauty, she is up on eBay with bidding starting at just one penny, I'm happy to ship worldwide. Best of luck! I will not make any more. Here's a piece I've been working on called "Smile" - definitely a bit different for me, but a lot of fun! Part of what is a more creepy & surreal series, combining elements of my usual sorts of works with some more abstract elements - this is a play on digital (but not digital at all, I'm doing it all by hand of course - no computers for me) aesthetics combined with elegant and timeless characters, juxtaposed to create unsettling imagery. It's also for anybody out there who has felt pressure to censor their own emotions to suit the preferences of others.